February 19, 1885 Jonathan Jasper Wright, lawyer and South Carolina Supreme Court judge, died. Wright was born February 11, 1840 in Luzerne County, Pennsylvania. After studying the law for three years and feeling himself qualified for the legal profession, Wright applied for admission to the Bar, but was refused an examination because of his race. 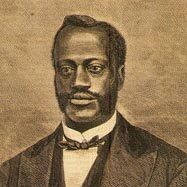 In 1865, he again applied for admission, was found qualified, and became the first African American admitted to practice law in Pennsylvania. In 1866, Wright was appointed the legal advisor for the Freedmen’s Bureau in Beaufort, South Carolina. In 1868, he was elected to the Constitutional Convention of South Carolina and helped draft the judiciary section of the state constitution which remains in effect today. Wright was soon after elected State Senator and in 1870 was elected to the South Carolina Supreme Court. He served the court for seven years before returning to private practice. The Jonathan Jasper Wright Institute for the Study of Southern African American History, Culture and Policy is located at Claflin University and the Jonathan Jasper Wright Award is given annually to an outstanding member of the South Carolina legal community.